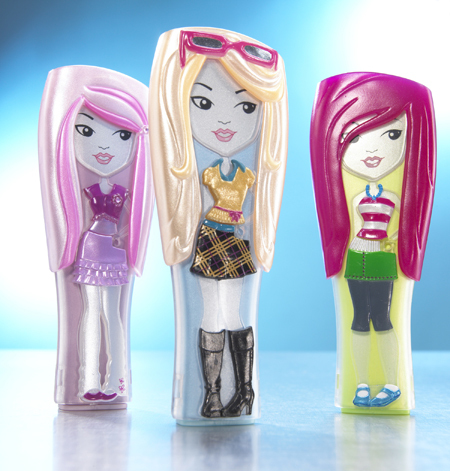 Is Mattel's coming Barbie Girls MP3 player an iPod killer? Uh, no. But it does have some kewl features that will appeal to tweeners and pre-tweeners. The players will come with detachable hair, clothes, and faceplates, and the devices will hold about 120 songs in built-in memory. A docking station is included, and there will be a slew of accessories so that girls can attach faux earrings to the player's earbuds or clip jewels onto the earbud cords. There will even be collectable tiny animal charms. At the New York City debut of the players, a score of girls in black Barbie T's demonstrated how the players can work with the Barbie Girls virtual world Web site. The kids were excellent Barbie ambassadors, given the fact that they grasp how it all works instantly (and they patiently explained it all to some of the, er, older journalists in attendance). After all, instant messaging and digital downloads are all a part of a little girl's daily world. After giving the player and Web site a test run (with a lot of help from my daughter), it's clear that Mattel is on to something here. But I have to wonder how quickly its audience will outgrow Barbie Girls and how soon will they be clamoring for a Barbie Girls smart phone. For more details on Barbie Girls, see the Web site article at J-Q.com. This entry was posted in Uncategorized and tagged barbie, mp3 players, new toys, quain, technology. Bookmark the permalink.